The only American known to have joined a volunteer unit within the Ukrainian military, fighting the anti-government forces in the country’s east, has been killed in action, authorities confirm. 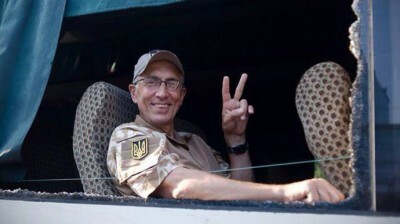 The killed fighter is Mark Paslawsky, a New York-born 55-year-old investment banker and US army veteran who took Ukrainian citizenship just before joining the Donbas battalion – a volunteer unit fighting alongside Kiev troops – in April. He adopted codename ‘Franko’ there. News of his death came in an August 20 Facebook post by Ukrainian Interior Ministry adviser Anton Gerashchenko, who said four fighters of the Donbas battalion died in a battle near the town of Ilovaysk, 35km from Donetsk, eastern Ukraine. “Among those dead is a Ukrainian citizen of American origin, codename ‘Franko’,” Gerashchenko wrote. The official says the military managed to take under their control half of Ilovaysk, which has seen some fierce fighting over the last two weeks. Maksim Dondyuk, a Ukrainian photographer working with the Donbas battalion, witnessed Paslawsky’s last minutes. Paslawsky’s family learnt of his death via the internet, according to his brother Nestor, who said that Mark had informed his relatives of his intention to volunteer for the Ukrainian military. Franko was not the only pseudonym Paslawsky used. He was active on Twitter writing under the moniker ‘Bruce Springnote’. Many of his postings were highly critical of the way the military operation in east Ukraine, which Kiev calls Anti-Terrorist Operation or ATO, was organized. Simon Ostrovsky of Vice News conducted a lengthy interview with Paslawsky two weeks before he died. It appears Paslawsky was a 1981 graduate of the US Military Academy at West Point, and served in the US Army until the age of 32. He had lived in Kiev and Kharkov, Ukraine, and also in Moscow for many years, working in the financial sector. His latest job was one of independent investment advisor. He joined the Maidan protesters, rallying against then-President Viktor Yanukovich, and for integration with the EU, at the end of 2013. Franko explained it was his Ukrainian background plus his dissatisfaction with the way the military operation was organized in eastern Ukraine which made him eventually volunteer for the Donbass battalion. “Given what I saw, the level of incompetence, the corruption, the lack of activity – I just decided that I needed to go and participate. If there was ever a time to help Ukraine this was the time to do it,” he told VICE News. Ostrovsky says ‘Franko’ was, however, worried of what the volunteer battalions could turn into after the military operation in the east was over. The American-Ukrainian fighter reportedly warned of the need to disband those units before they evolve into dangerous and uncontrollable force.